Launched in 2008, the outgoing Ford Fiesta must go down as one of the most successful cars ever built by Ford, not just in Europe, but globally. In the UK, it’s been the best seller in its class for the past eight consecutive years and one million have been sold in the UK in total. Its replacement is larger, but not by much, at 70mm longer and 13mm wider. The exterior design isn’t a step change, either - more a subtle evolution of the existing shape, and unlike the bigger Focus, you can still choose between both three and five-door versions. The main news is that the interior has been given a major overhaul. The old audio unit, with its slightly bewildering array of buttons, has gone and in its place there’s a large, slightly incongruous 8.0in floating touchscreen on the dash. Plenty of technical options are available, too, including a full suite of advanced driver assistance features, including automated parking, cruise control and pre-collision assist with pedestrian detection. Core models are the entry-level Style and Zetec, with the rest of the range split into two threads: sports and luxury. Sports models include the ST-Line and ST-Line X, with the 197bhp ST due next year. The luxury models comprise Titanium, Titanium X and the Vignale, which is due later this year. We've previously tested the ST-Line X trim with a 138bhp 1.0T Ecoboost engine. A hook-up with premium audio maker B&O means you can order a Fiesta with a 10-speaker, nine-channel, 675W audio system as an option or by buying specific models, such as the B&O Play Zetec Series or B&O Play Titanium Series. 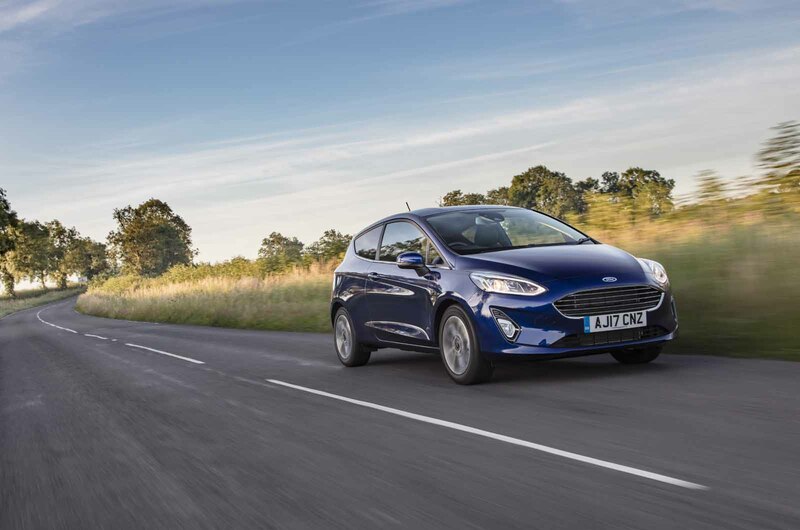 The good news is that the Fiesta’s outstanding handling, ride and steering qualities are unaffected by the increase in size; if anything, they’re even better than before. The steering is light enough for easy parking but loads up nicely in corners to give plenty of feel. Grip is good and that much is telegraphed back through the wheel, making quick drives on twisting country roads fun and confidence-inspiring, even in the wet. There’s little body roll but, despite that, the ride is supple and effective damping ensures there’s no skittering on poor surfaces. As before, brakes are powerful, if oversensitive, and would benefit from more pedal feel. No turbocharger means this 84bhp engine lacks more than just power; the diesel-like punch of its boosted sisters is also missing when you accelerate. Because of that, response feels sluggish, although speed soon builds up with patience. The naturally aspirated engine is gruffer than the refined turbo versions, too, and its three-cylinder configuration more noticeable. The interior is where existing Fiesta owners will notice the biggest difference, though. On a purely subjective level, it feels even more spacious and has been decluttered, with far fewer buttons. 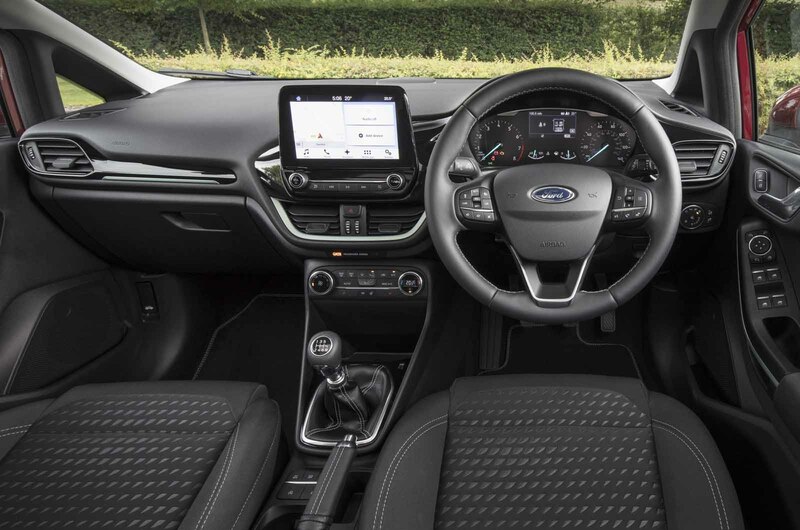 The 8.0in floating touchscreen fitted to most models is slick and bang up to date, giving access to the Ford Sync3 infotainment system, complete with Apple CarPlay as well as sat-nav and rear-view camera displays when fitted. The 84bhp Ti-VCT engine is surprisingly capable, considering its small capacity and the absence of a turbo, but most drivers will probably find its shortage of initial go tedious unless driving is confined purely to urban streets or you really do want nothing more than a utility shopping car. Prices range from £12,715 for the entry-level 1.1-litre Style to £21,225 for the Vignale when it arrives, while the price of next year’s ST has yet to be revealed. If you really are desperate to spend as little as possible and performance means nothing to you, the 1.1-litre Style is probably better value than the higher-spec Zetec driven here. The three-door, 1.1-litre Zetec costs £14,215 on the road, whereas the 99bhp, six-speed Zetec in the same bodystyle with the 1.0T Ecoboost engine is not much more at £14,795. Since that extra £580 will make the difference between lacklustre performance and arguably the best car in its class that’s great fun to drive, the choice should be an easy one for the majority of buyers. I'm not convinced that it matters that much to most buyers in the UK, but I suspect the design of the new Fiesta will look aged within 2 years. It's very clearly a resin of the really sharp previous car, and I think the new Ibiza, Polo and C3 already show up its underlying age. The new Polo is even more regressive. Both will continue to be the best selling small cars across Europe. ..slow which will give you time to realise how over priced the Fiesta is. Remember these are 3 door versions so when making 5 door comparasions you need to add £650 making a basic'ish Zetec with a 1.0t £15,450. £500 more expensive than the TOP-SPEC's 1.0t Suzuki Baleno, or £1,500 more than the equivalent Baleno model. Looks too similar to the outgoing 9 year old design, which admittedly aged well. With such a familiar look I doubt this version will age quite so well. Unfortunately where design is concerned, evolution seems to be the name of the game with too many manufacturers these days. The dash is awful, the old one looked much better - the touch screen looks stuck on and at a weird angle. Apple Carplay but no Android Auto ? Adjustable boot floor £75 (even for £21,000 vigale version)! A/C not available unless you spend £12690 for the Polo S A/C still only available with a 60ps engine (so A/C effectively costs £720). A/C and curtain airbags and airbag deactivation are standard on every fiesta, dont you think they should be standard on a vehicle from a supposedly higher quality brand? The base Fiesta costs £12715 or £25 more than a lower powered base Polo with A/C but lacking safety features . The evolution design approach to styling hasn't harmed VAG and I guess that is the whole point of its styling. It is meant to make the car look classy over its lifespan. Ford can't win either way! Whacky styling it will be criticised evolutionary styling it's still criticised. I assume this relates to the entry price of the old Fiesta? Well it's a full £3k less than than the entry price mentioned in the text. Or has Ford started discounting the new model already?